SERVPRO brings in the life size examples! 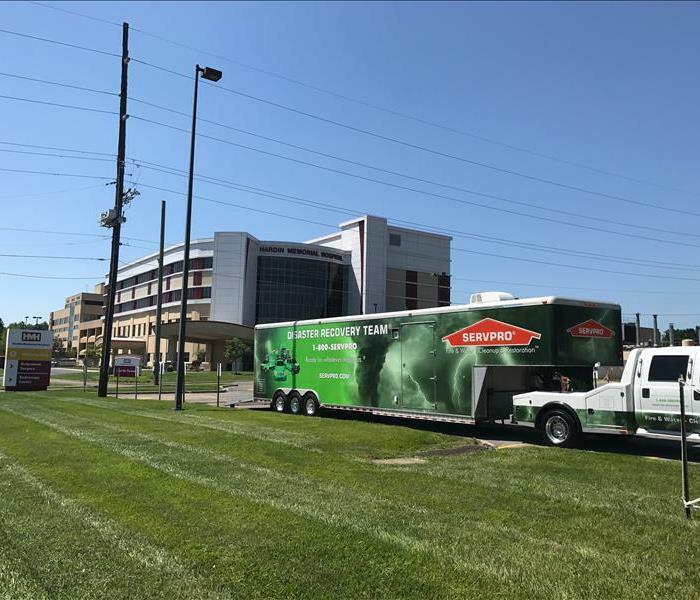 At this disaster relief expo, SERVPRO offered educational information as well as partnered with our local agencies to show our community for which we serve that we are on their side! At SERVPRO we have fun! 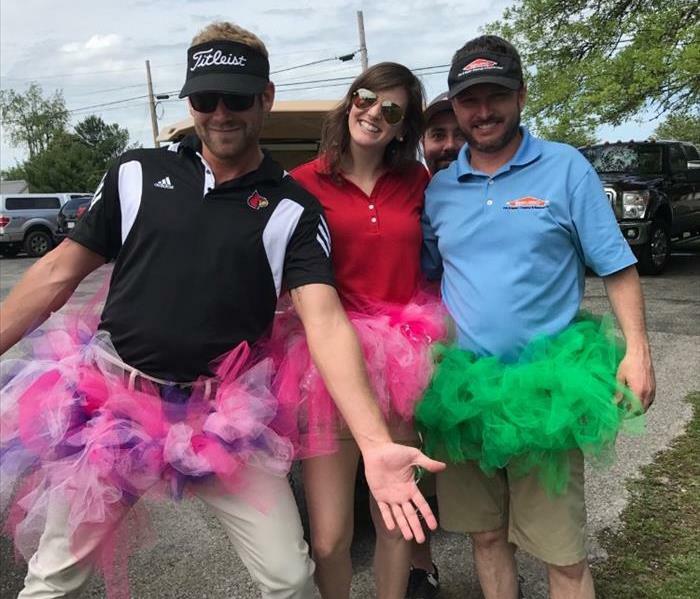 While offering the best and the most proProfessional of services and quality care to our customers, our SERVPRO employees enjoy having a great time we well as pictured here at a community golf outing! SERVPRO offers class for free! We thoroughly enjoy to serve the citizens that we share our communities with. 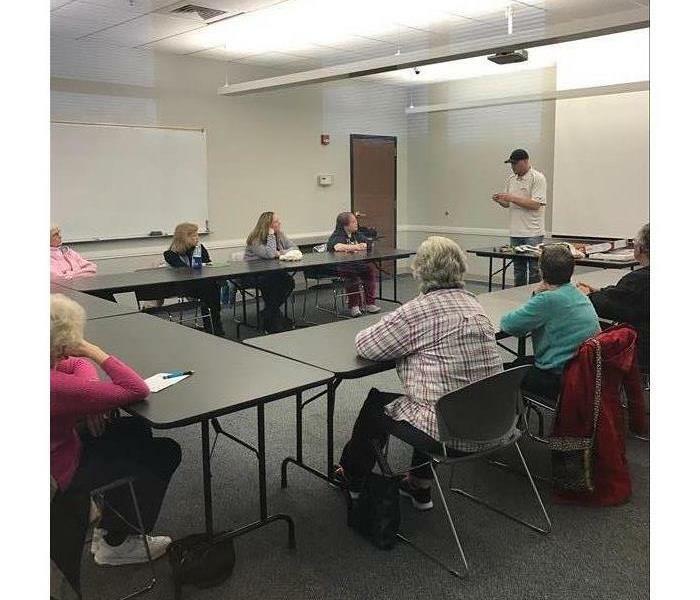 We often offer free courses that are taught by our highly trained professionals so that our neighbors can have the best in home improvement. 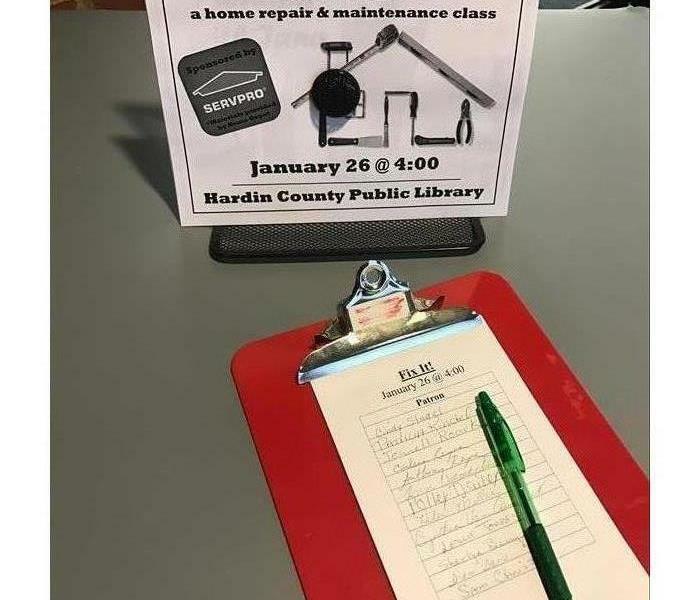 SERVPRO offering free courses with home improvement ideas and how-to’s to help with as much community involvement as possible. We enjoy giving back to those we share our communities with! 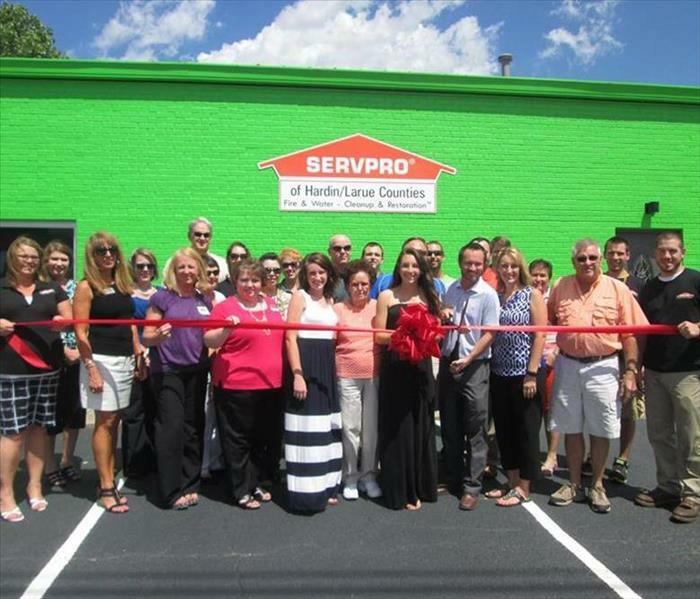 SERVPRO Partners with a local Chamber! SERVPRO always enjoys having the ability to serve the community in any way possible. 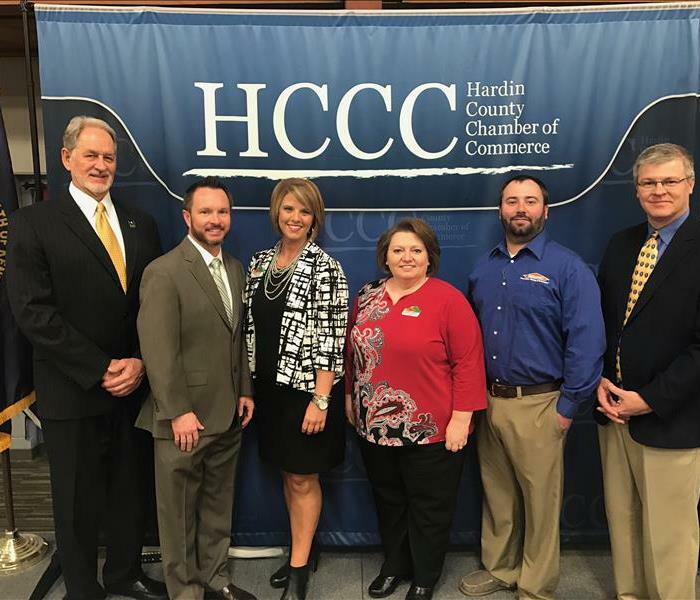 As we have our typical community events we also participate in our local Chamber of Commerce groups. 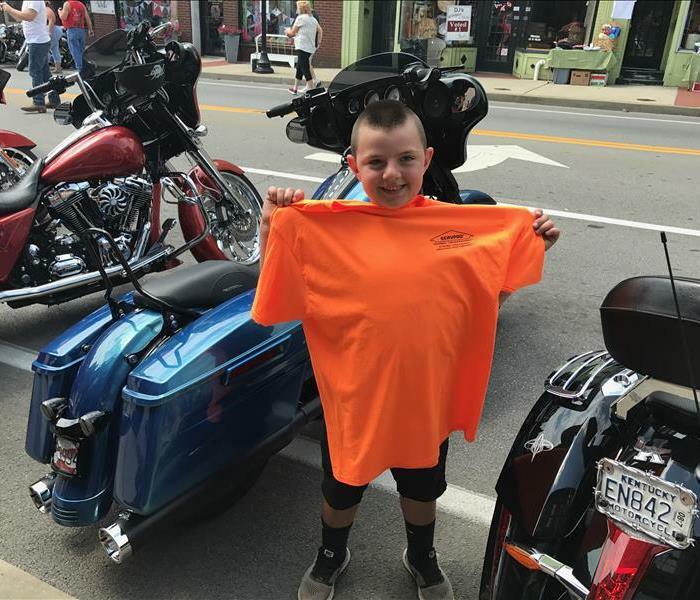 SERVPRO gave back to the community by handing out T-shirt’s to our local kiddos. At this specific event, Bikes, Blues, & BBQ a young man got a free SERVPRO T-shirt! This home had a major water-loss. They called SERVPRO and we had to bring the heat. We brought almost our whole team to assess the damage and begin the repairs. No matter the damage we are there for you. 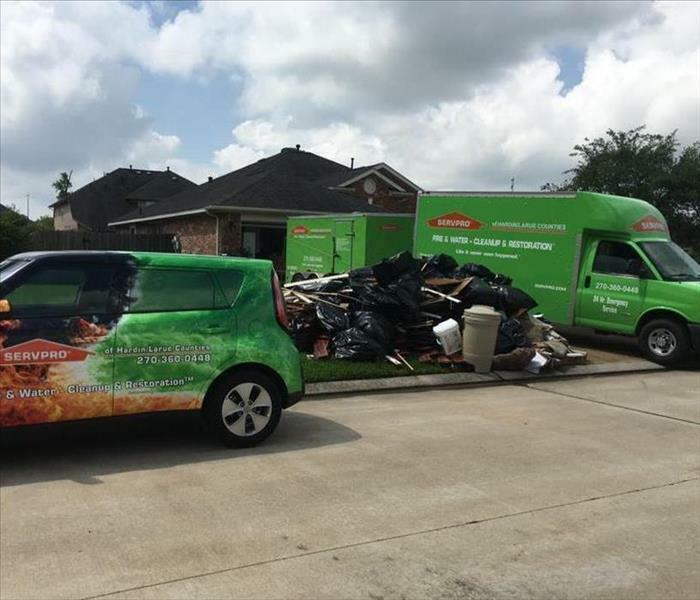 Big or small SERVPRO will be there for you in your time of need! If you have a fire in your home, it may affect areas other than the room the fire originated in. 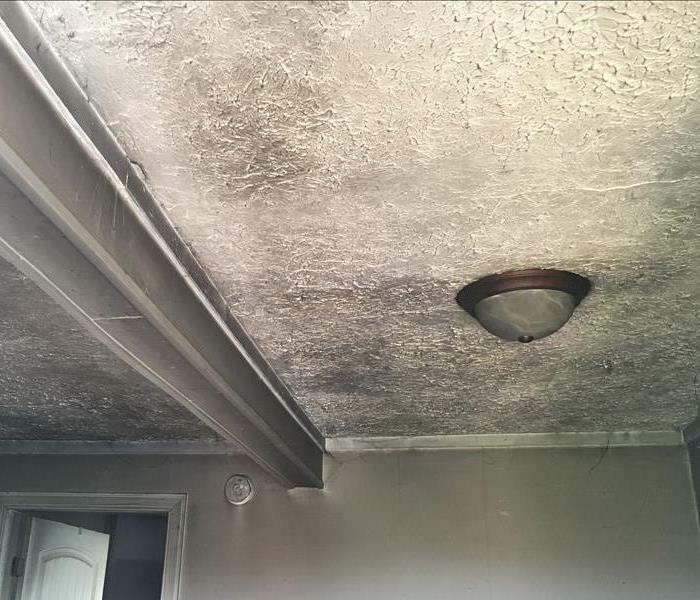 Though this house fire originated a few rooms over, it still covered the ceiling of another room. 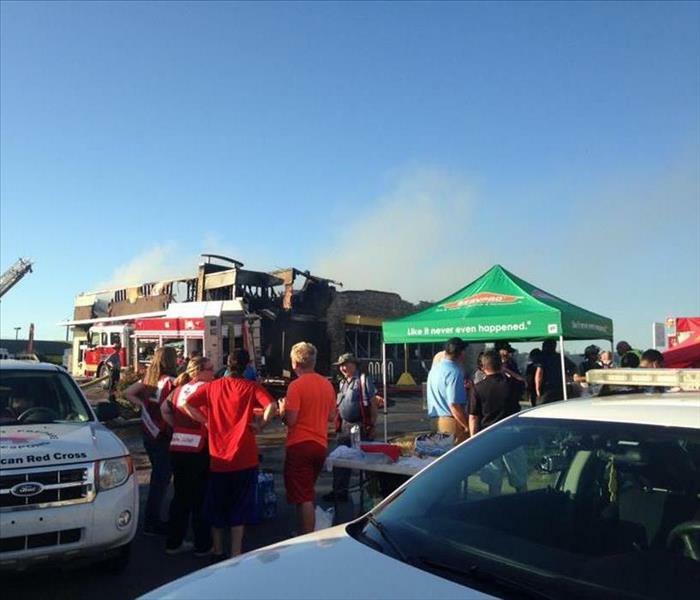 Here at SERVPRO we specialize in the cleanup and restoration of your home after a fire. Give us a call today! 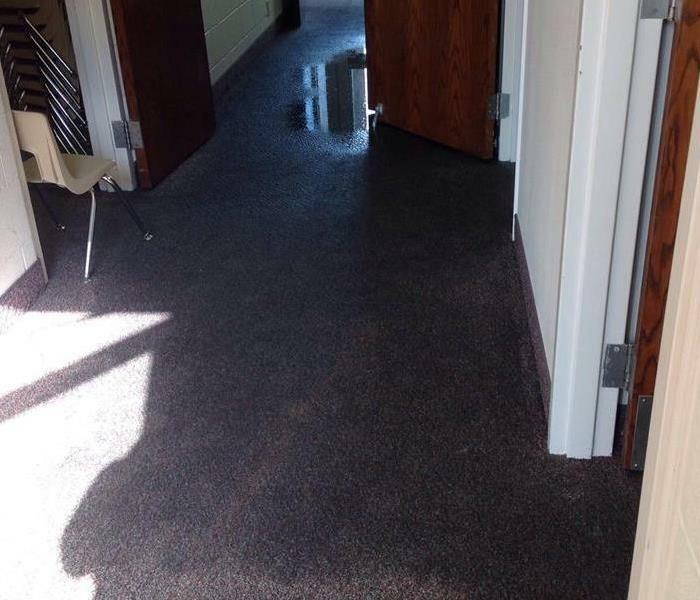 This local church suffered from a water-loss and had so much water in areas that the carpet was completely saturated and water was standing on top of the carpet. Luckily this church called SERVPRO and we were there to assess the damages and make necessary repairs so we could make it "Like it never even happened." 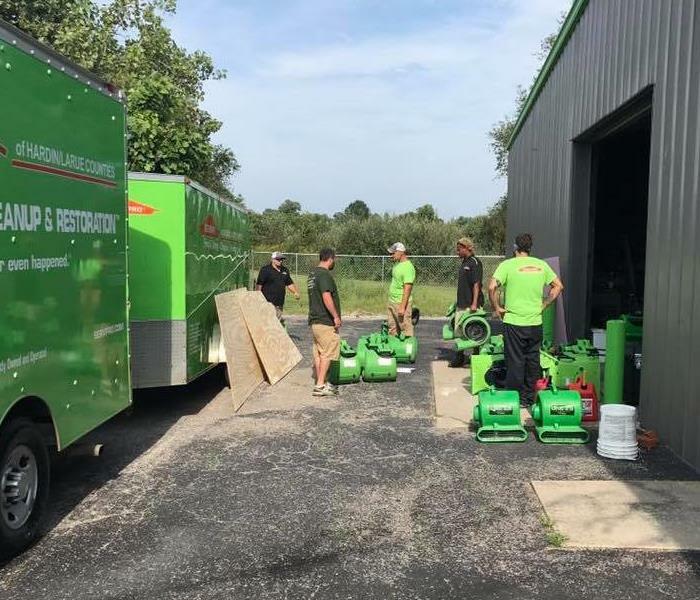 If your home has been affected by water damage our experts at SERVPRO can determine whether or not your floors need to be removed in order to prevent mold and properly dry the area. 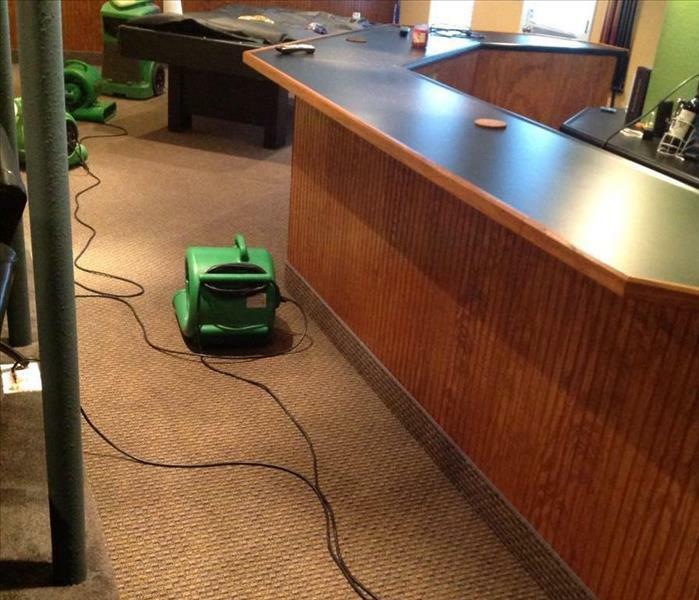 This church trusted SERVPRO to handle their water damage. We use our high tech equipment to extract the water to aid in the restoration process. In Kentucky the weather is unpredictable. 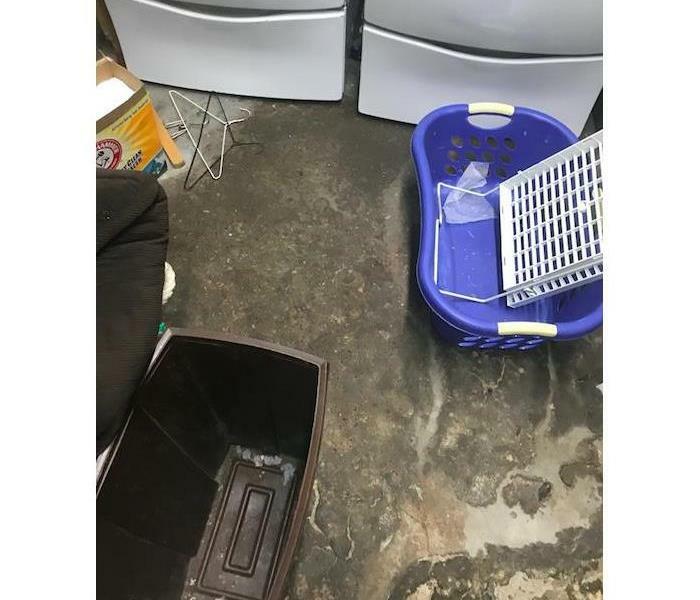 This local basement flooded during a heavy downpour that resulted in flash flooding. 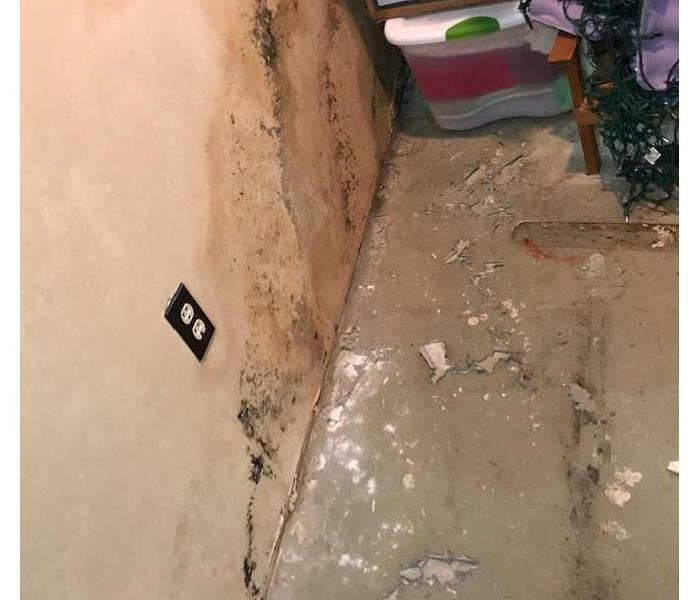 SERVPRO was on the scene to aid in drying this basement to ensure mold would not develop. Do not forget to check for mold under your kitchen sink as this is a common area to develop mold. If your home has a mold problem, call us today! 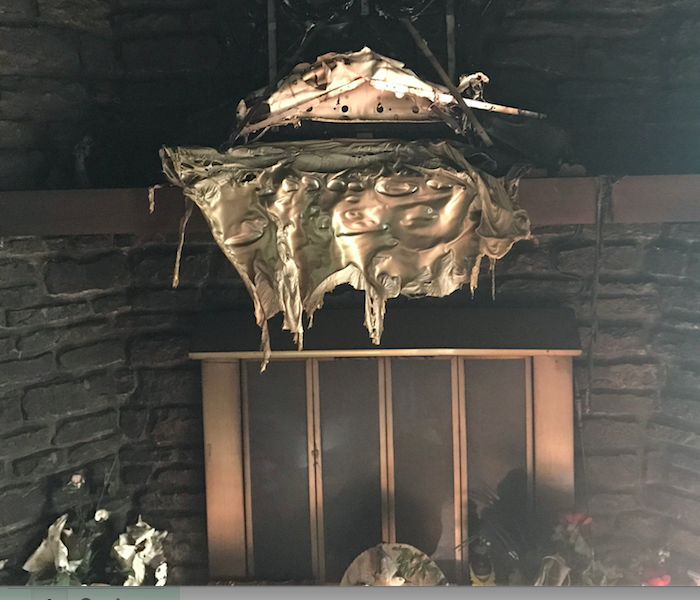 This local house fire burned so hot that it melted the TV. 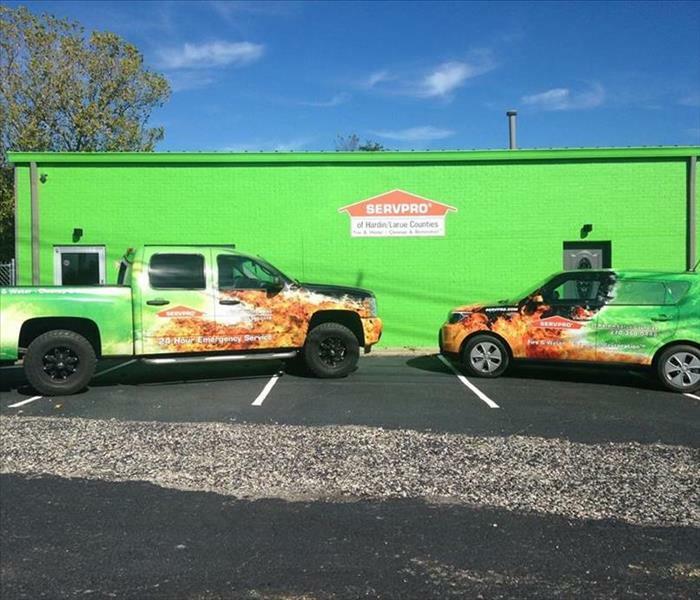 SERVPRO can handle any fire restoration big or small. Give us a call today! This local house fire resulted in a BIG mess. At SERVPRO we specialize in restore a mess like this to a like new condition. We truly make it "Like it never even happened." 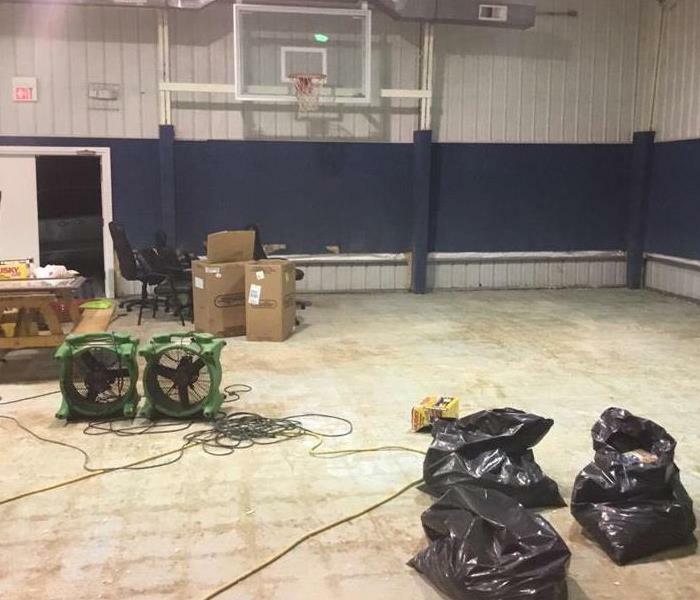 This local gym had a major pipe burst, flooding the entire area. 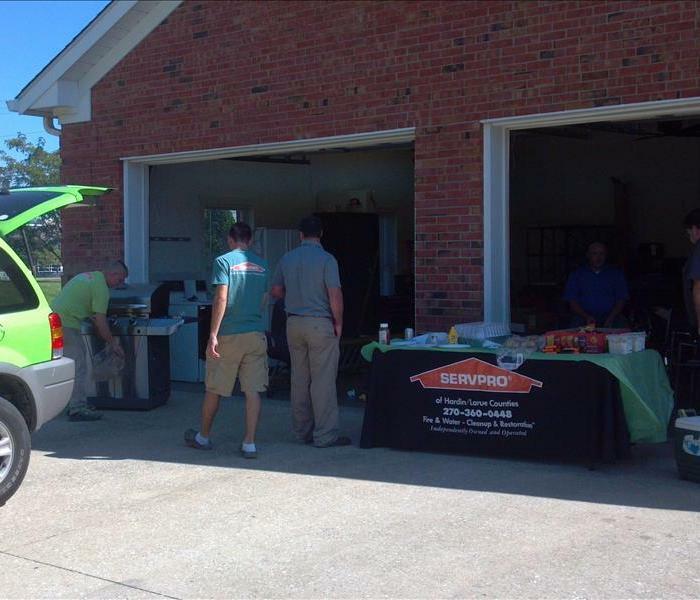 SERVPRO was swift into action to help them restore their area back to a preloss condition. This local courthouse suffered from a water loss that required the floors to be removed in order to dry the affected area. They trusted SERVPRO to make it "Like it never even happened." Flooding can happen ANYWHERE. This local school had a bad water loss on the lower level. 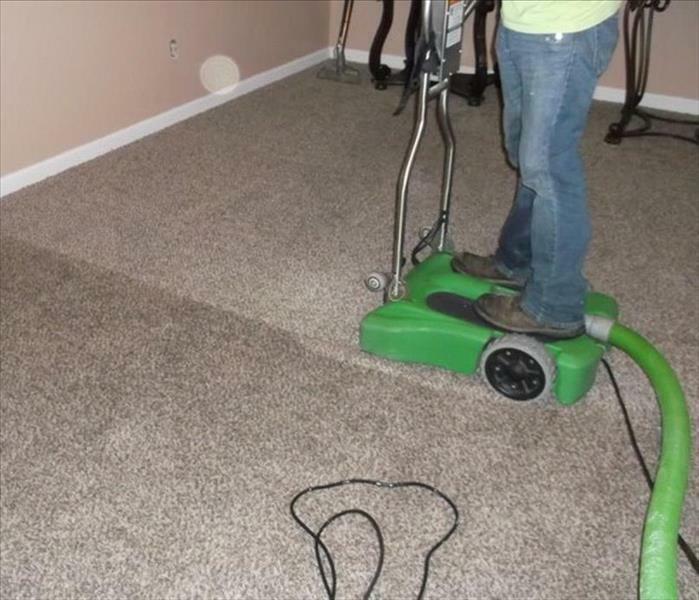 Luckily, they trusted SERVPRO to handle the job quickly and effectively. 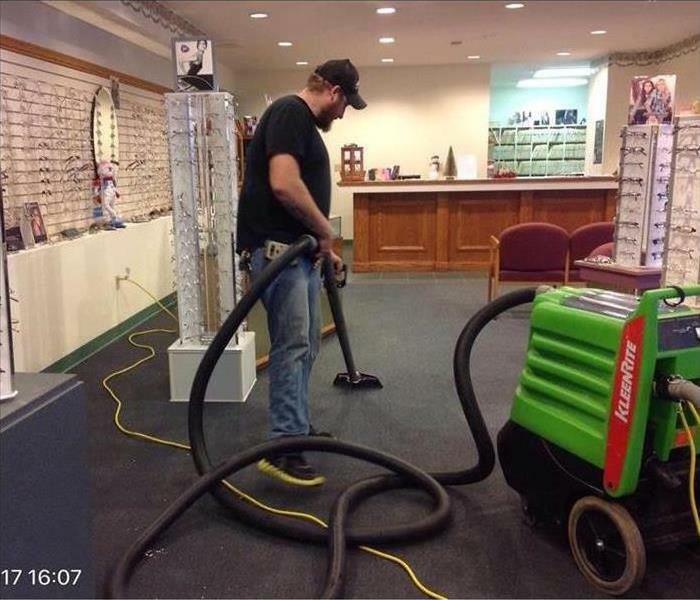 This local eye care business trusted SERVPRO in their time of need. 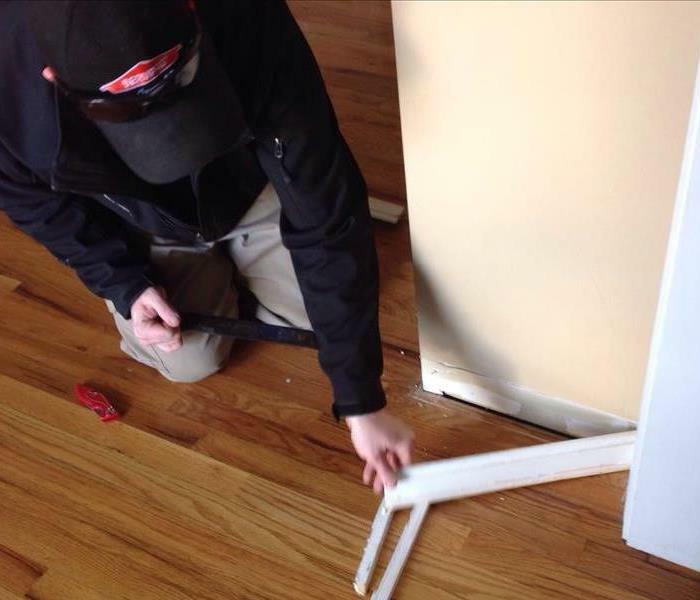 SERVPRO can work around any obstacles and take care of the problem anytime. 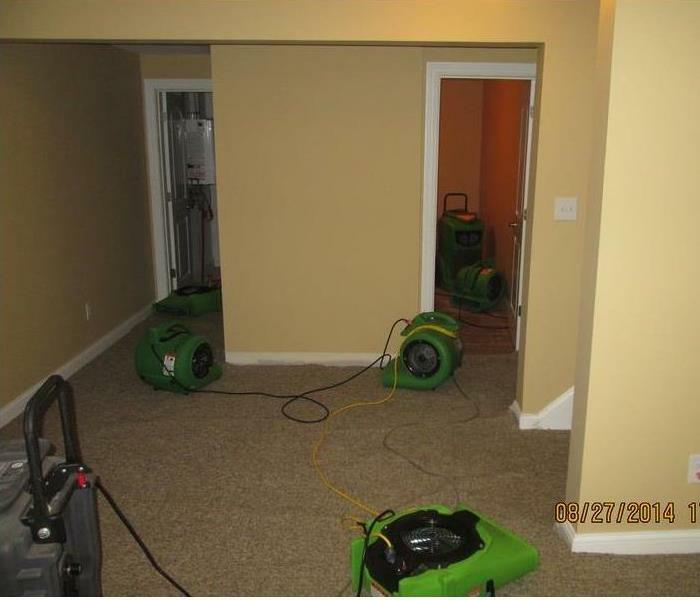 Our high flow air movers in action drying floors after a major water loss. SERVPRO is always there for you, rain or shine. 24/7 365 Days a Year. Our SERVPRO team leaped into action to remove old trim after this water loss. 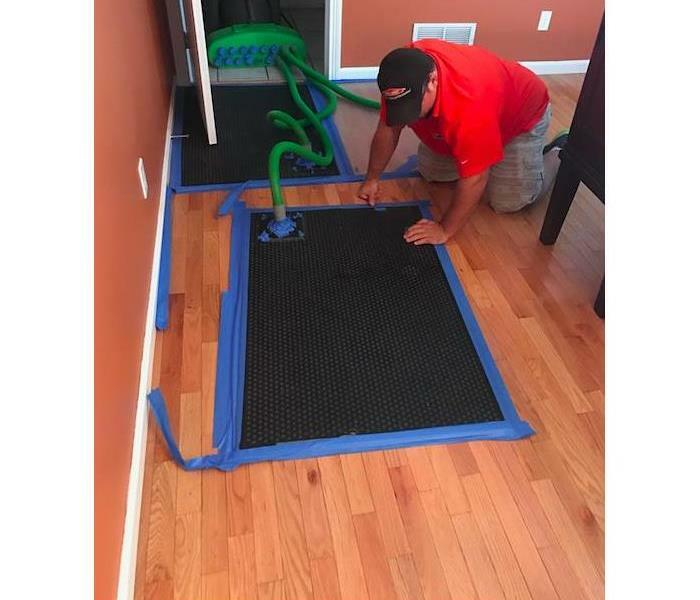 You can always trust SERVPRO to do it right and not cut corners. Hurricane Harvey destroyed the side of this building. 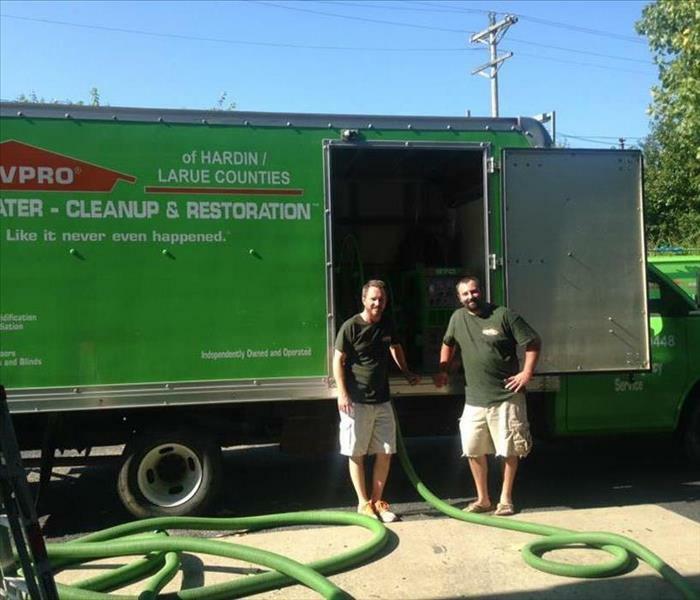 SERVPRO traveled all the way from Kentucky to offer aid and support to those in need. 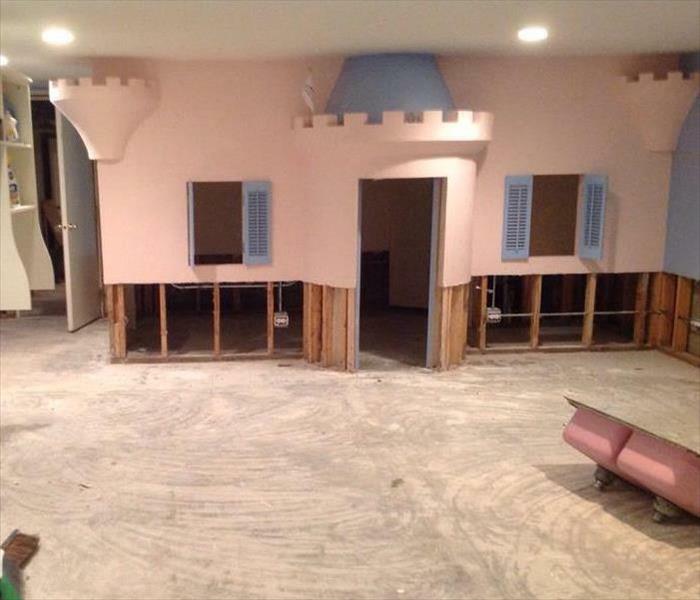 Heavy rains and wicked storms caused flooding to this children's playroom. Luckily SERVPRO was their knight in shining armor and we were able to make it as good as new. This home developed a mold spot on their ceiling due to a leaking roof which dripped into the attic. 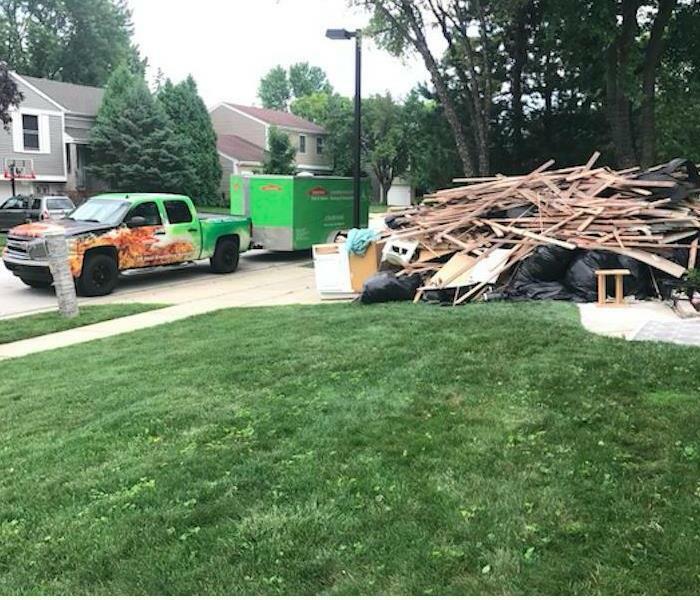 They called SERVPRO and we were happy to help. 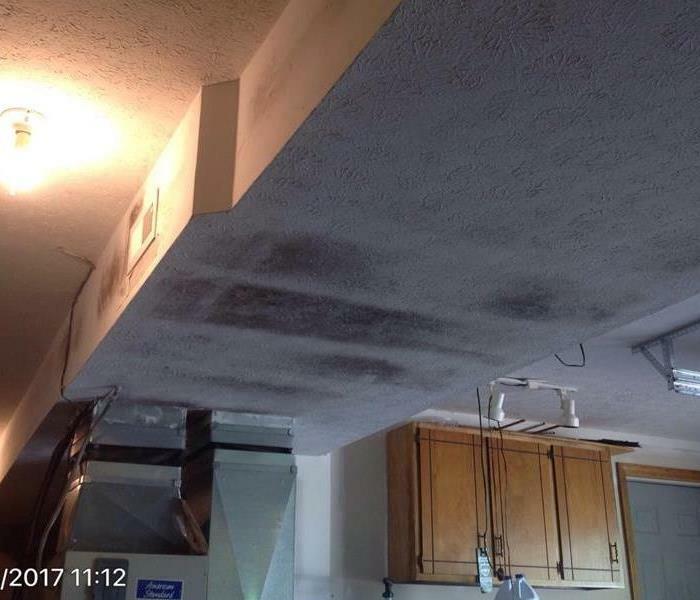 Unfortunately, this local home became infested with mold due to a leaking refrigerator line. 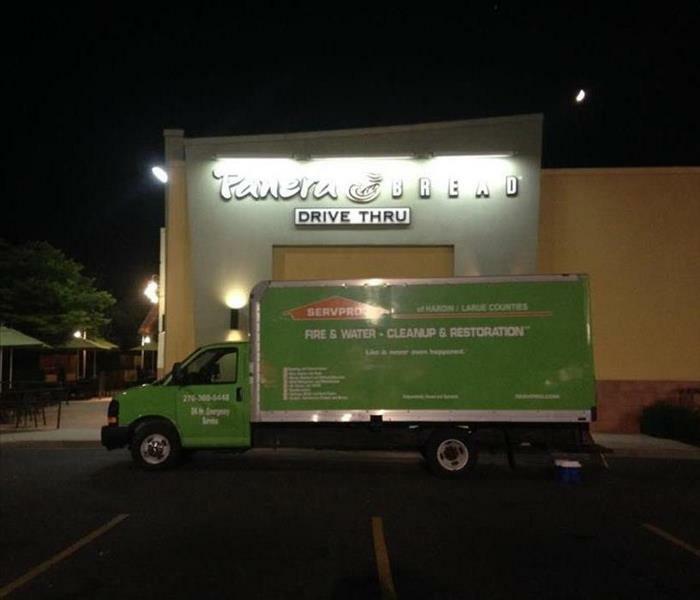 Fortunately, they called SERVPRO and we rushed on the scene and immediately took care of their needs! This local business had a rough fire. 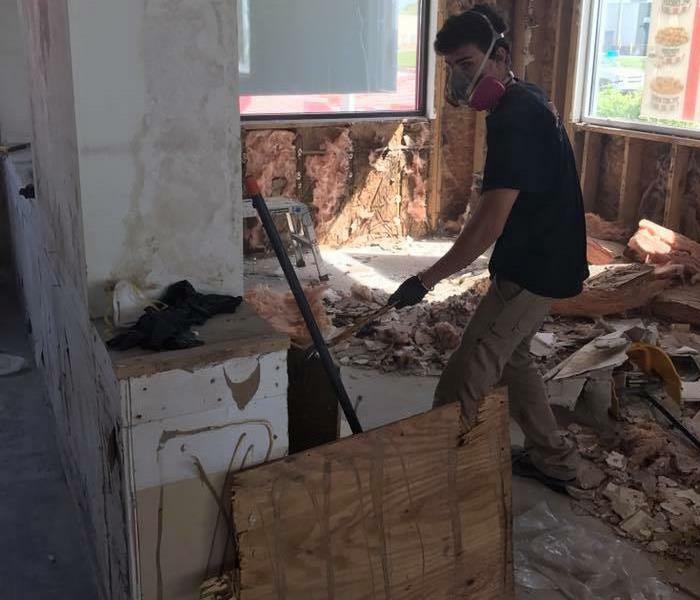 They called SERVPRO and we began gutting the interior of the business immediately to prepare for reconstruction. 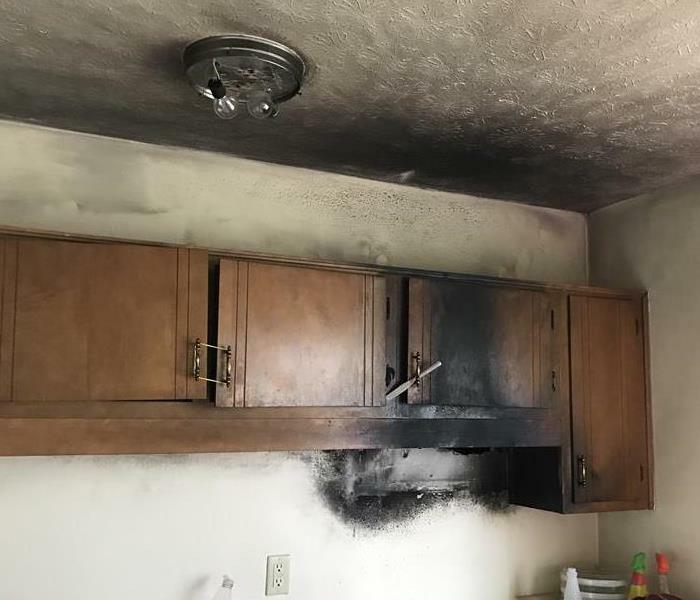 This unfortunate stove fire was handled by SERVPRO. We were able to make it "Like it never even happened." This was a commercial job we were doing for our local court house. Having prime access to the building entrances is important for our service professionals to be able to get in and get the job done quickly. Standing water requires quick extraction and we couldn't do it without the proper equipment and access. 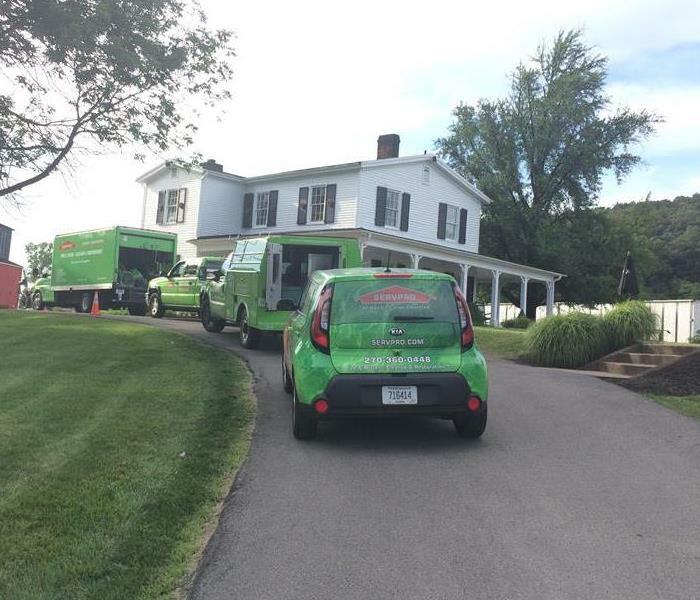 After a fire broke out in a local home in Elizabethtown KY, SERVPRO was quick to the rescue! 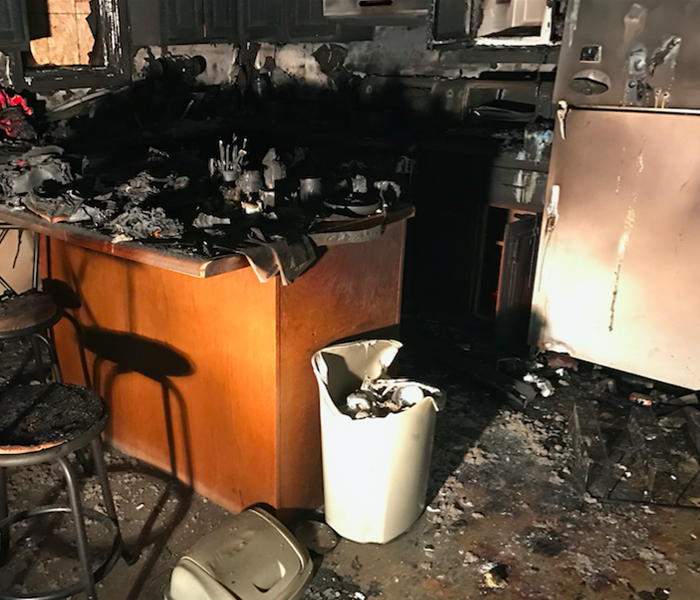 Fire damage can be devastating and the restoration can be a hassle. But don't worry, you can always trust SERVPRO! This was the aftermath of a kitchen fire, when we arrived at the scene. There was significant smoke and soot damage. The owner could not believe how quickly we were able to complete the process of getting there home back to normal . The water from sewer backups can be unsanitary and may contain bacteria and viruses. SERVPRO of Hardin/Larueis trained to inspect the contaminated water and plan the appropriate response for your home. We remove the contaminants and moisture to help ensure the structure is properly cleaned, disinfected, and deodorized. You can breathe easy knowing our 1-4-8 response guidelines. The hot water heater had leaked in this Hardin County home for an undetermined amount of time causing mold to grow. The water leak was resolved and we came to the rescue .SERVPRO of Hardin/Larue was able to resolve the issue fast and affectively to leave the home owner very happy. When storms hit, we can scale our resources to handle a large storm or flooding disaster. We pick up and leave to help those in need and meet some special people along the way. 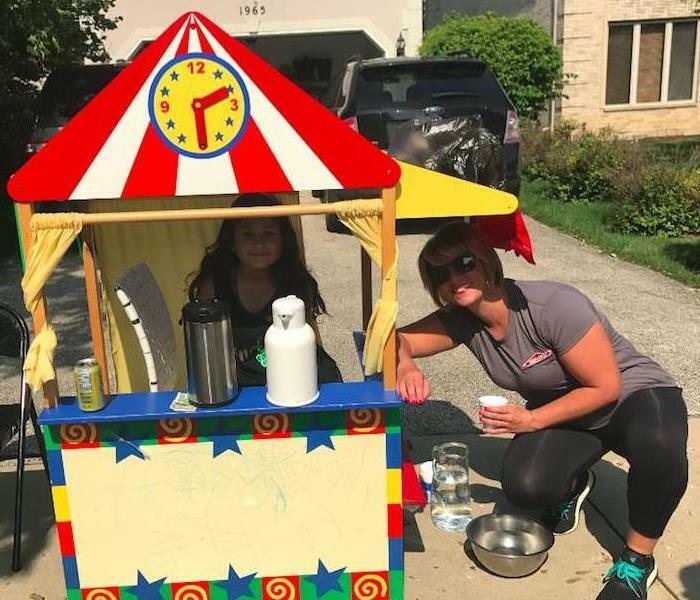 This little girl set up on her street and was so eager to sell drinks. It makes you realize that people do come together when needed. This house in Chicago sustained substantial water damage during the recent flooding. Our team traveled 4 hours and spent 10 days helping flood victims get their properties cleaned up. Just one way that SERVPRO goes above and beyond to help make it "Like it never even happened." 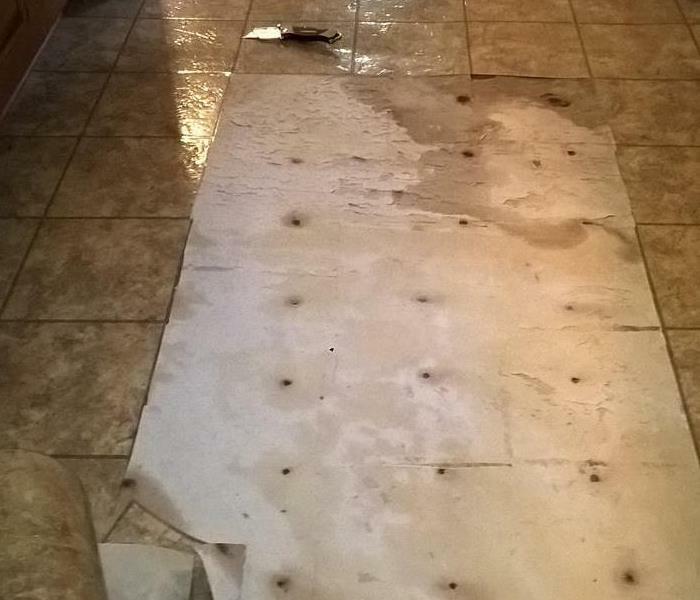 A burst pipe in this Elizabethtown, KY home caused damage to the hardwood flooring. 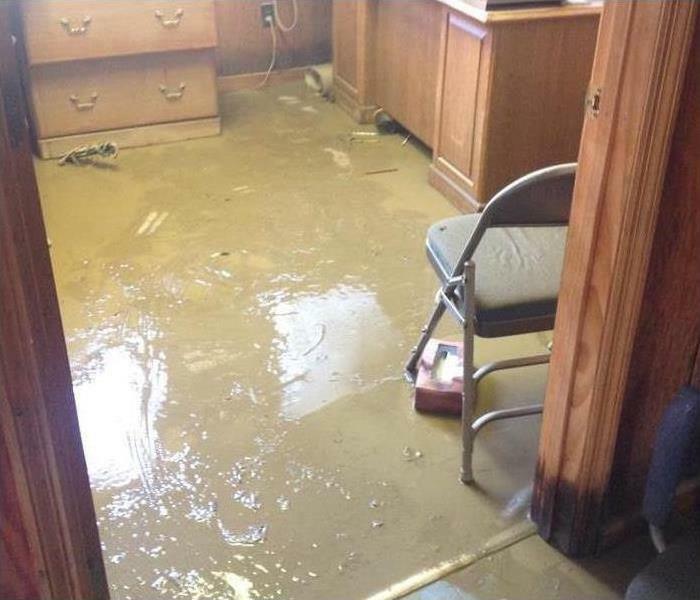 Our crew at SERVPRO of Hardin/Larue was able to put drying mats in place to pull the water out of the wood and make sure that the flooring did not buckle. With all the devastation happening in Texas, it laid heavy on our hearts like many others that we needed to go help. We assembled a team a they are on their way to provide relief. We take great pride in our local community, but we are just as happy to provide our services around the country. Here, we are getting our trucks ready to head to Illinois to provide our services to the communities effected by storm damage. 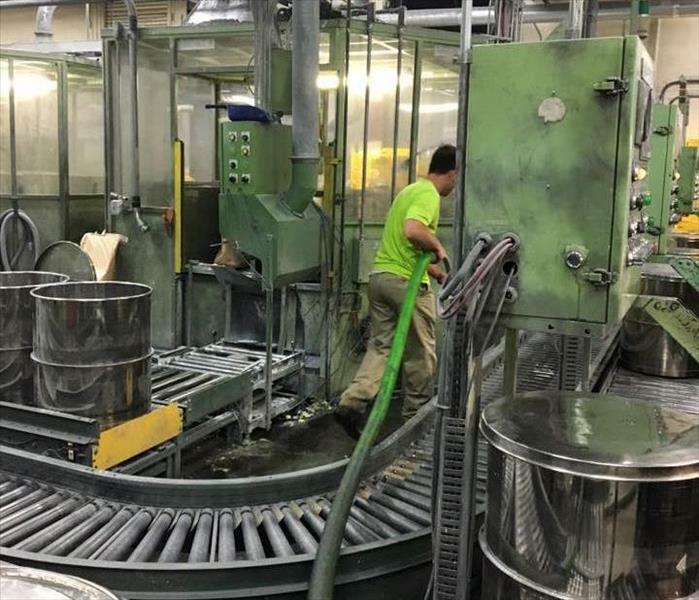 Akebono's sprinkles system was set off on accident causing an unsafe and hazardous work environment. We were brought into clear up all the water so they could get back to work! Mold is a nasty problem to have that is why it is best to contact trained professionals. If you think you may have mold, give us a call. This local restaurant gave us a call and we were able to assess them as mold-free once the job was done. Some things are hard to clean and for that there is SERVPRO. Give your patrons peace of mind knowing that your company is professionally cleaned. We are a 24/7 service that is ready to assist you. A local McDonald's caught fire burning most of the restaurant down. The local firefighters were able to put out the fire and no one was hurt. We arrived at the scene to provide water to the fire fighters and volunteer workers. If you don't do this, then you may end up with a huge mold problem on your hands. Any time water enters your home, it is best to work with trained professionals to mediate the problem. 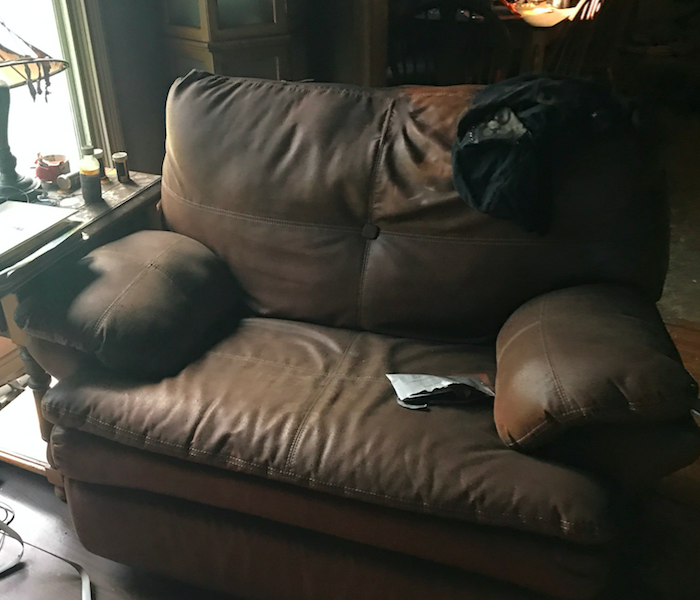 The water damage at this house went unaddressed for far too long, which led us to the decision to remove many items from the home. This is one of our trucks extracting water at a flooded shop in Elizabethtown. The owner couldn't believe how quickly we arrived and extracted all of the water from his shop, saving him thousands of dollars in damages. This is a picture of us at Kentucky Farm Bureau in Elizabethtown, KY. We grilled out some burgers and snacks for the agents and adjusters. We all had a great time. This is a picture of our equipment running at the Hardin County Health Department. We had to extract water from 2 levels, remove drywall and insulation, move a lot of medical equipment and run a generator to power everything because the electric was off. We were very proud of the job we did and the customer was very happy too. This is a photo of our employee using a rover for weighted extraction of water. You can see from the picture that this machine works great on wet carpets. With our fast response time and the best equipment, we can save you a lot of money. Congratulations to our owners Dewayne and Lisa Cox for the Grand Opening of your new location. The new building is complete! We are excited to have a larger space to be able to serve our customers even faster! Having your ducts cleaned lowers your indoor air pollution and reduces pet dander. Cleaning your system on a regular basis will also prolong the life of your unit as well as restoring your system to its peak operating condition. Having your air ducts cleaned will also eliminate odors lurking throughout your home or business.